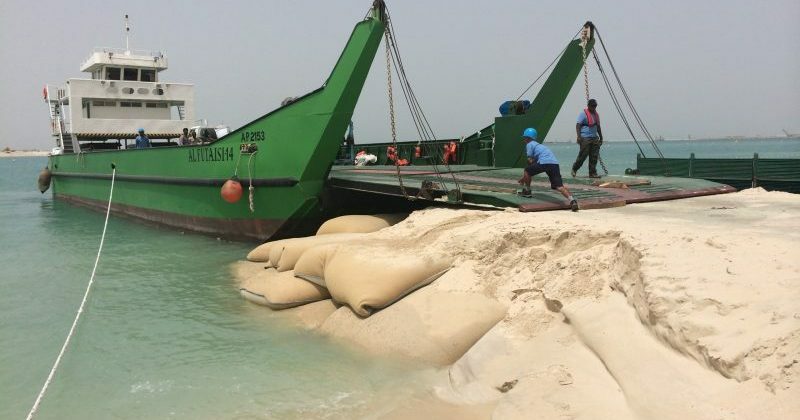 Ecocoast was contracted to design and install temporary barge ramps in two locations to facilitate construction works on an island off the coast of Dubai. To design a cost-effective solution to enable 24-hour barge transfers from mainland Dubai to an island off the coast of Dubai. The location on mainland Dubai was relatively exposed to wind and waves, and the barge ramp would be utilized by a number of vessels in high frequency during a 2-month period. The challenge was to design a robust, durable and stable structure within the client’s budget and within Municipality regulations. Ecocoast designed the temporary barge ramps using 5t geosynthetic containers (bags) – a product typically used for coastal protection structures. Geosynthetic containers were an ideal solution for the project, as they are quick to install and remove, and their composition from heavy-duty vandal resistant geotextile makes them highly durable. The 5t filled weight of each individual bag also ensured a robust and stable structure to withstand Shamal wind and waves. The design and regulatory approval process needed to be backed up by Ecocoast’s coastal protection design calculations and expertise. The bag structure also had a low impact on the environment compared to a more traditional structure, with the barge ramp areas quickly returned to their original condition following completion of the construction works.